Heals blocks to spiritual energy. Opens blocked ability to know and manifest one's life purpose. Heals lack of connection with the Goddess, lack of spirituality in one's life or lack of reason for "be-ing". Rhodochrosite has a trigonal crystal system. It is a carbonate mineral and is formed in the oxidation zone of manganese ore deposits as a secondary process. Water that contained manganese and carbonic acid collected in hollows of the ore deposits and formed stalagmites and also filled in cracks in the ore. Deep pink crystals up to several inches across have been found in Colorado, but generally in the US, most of what is found is a milky pink color that can also have pyrite, fluorite or quartz inclusions. Many deep red, almost transparent, nicely banded crystals have come from Argentina. There are also some with a very thin quartz coating that come from Cananea, Mexico. Rhodochrosite can be worn at heart level to stimulate circulation and to purify blood. A piece can also be placed on your neck behind your head to relieve headaches. It may be worn and used anywhere on the body with sufficient results. Rhodochrosite provides its user a positive and enthusiastic attitude towards life. It stimulates an all encompassing love. 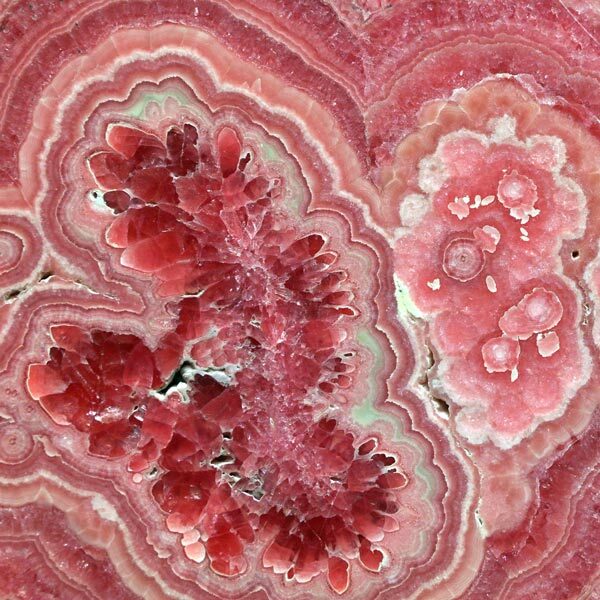 Rhodochrosite will encourage activity, liveliness, eroticism and spontaneous expressions of feeling. Get ready for some fun! It offers a great mood lifting effect and makes us light and cheerful. Rhodochrosite brings wakefulness, causes us to become busy, fills us with ideas and helps make work seem easy so that we may succeed. It is also carried to draw love to us. Rhodochrosite stimulates circulation, blood pressure, kidneys and reproductive organs. It assists blood vessels to become more elastic which results in its effects of easing headaches. Rhodochrosite has a special affinity with those born under the sign of Cancer. Its Energy is Projective,its Planet is Mars, and its Element is Fire. Rhodochrosite had been called manganese spar or raspberry spar. It's name comes from the Greek meaning rose colored. Even though it is considered to be a stone for the element of fire for magickal purposes, it works well for soothing the emotions. 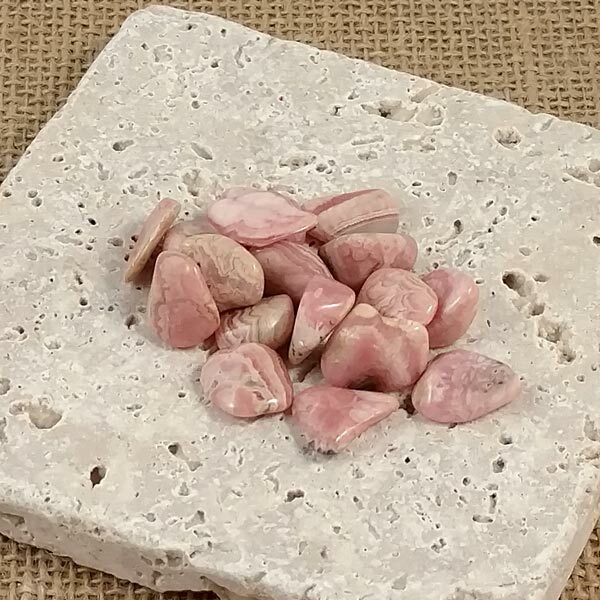 It is said that if you place a piece of Rhodochrosite under your pillow it will not only enhance your dreams, it will enable you to remember them. It's compatible stone is Malachite which can also be used for the same purpose. I find the effects from Rhodochrosite to be a bit softer and kinder than those achieved with Malachite.